The Coca-Cola Games are now currently underway with the Junior Girls High Jump. The Coca-Cola Games march pass this morning was cancelled due to the weather conditions. 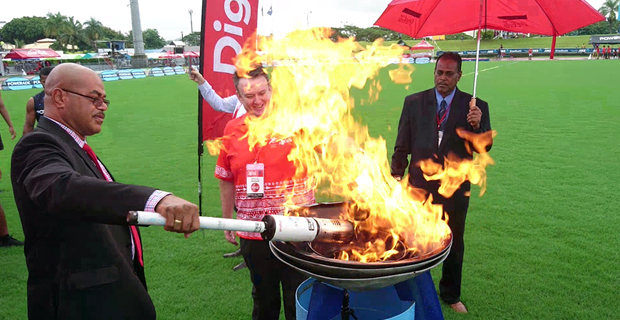 Thirteen gold medals are up for grabs in Day 1 of the Coca-Cola Games at the ANZ Stadium. There are six gold medals available in the girls division and seven in the boys division. The finals of the Junior Girls High Jump, Senior Girls Long Jump, Intermediate Girls Triple Jump, Junior Girls Javelin, Intermediate Girls Discus and Girls 1500 metres will be held today. In the boys division, the final of Senior Boys Shot Put, Intermediate Boys Discus, Sub Junior Boys Javelin, and all grades of the Boys 1500m will be held today. The girls 1500 metres will start at 4.18pm today. The heats of the 100 meters will start at 10.58am today. The Senior Girls 100 metres heats will start at 12.58pm today while the Senior Boys 100 metres heats will start at 1.18pm. The 400 metres heats will also be held today. It will start at 1.38pm. The defending champions of the Coca-Cola Games are Adi Cakobau School and Ratu Kadavulevu School.